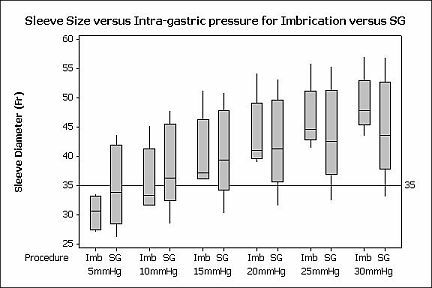 Is Intragastric Pressure Lower in Gastric Imbrication Compared with Sleeve Gastrectomy ? There is growing interest in the emerging gastric imbrication, or laparoscopic greater curve plication sleeve procedure. 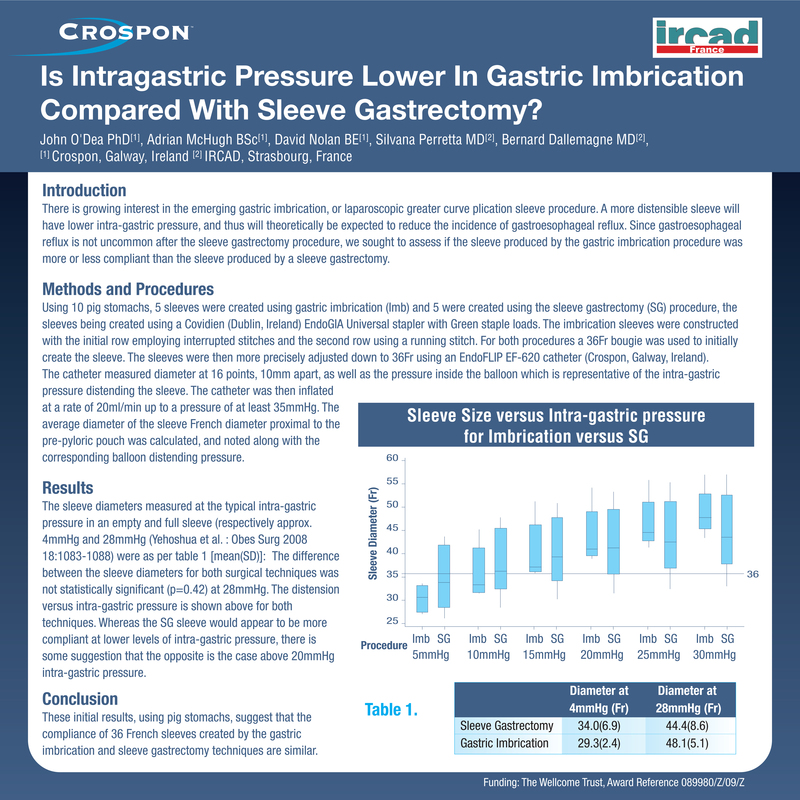 A more distensible sleeve will have lower intra-gastric pressure, and thus will theoretically be expected to reduce the incidence of gastroesophageal reflux. Since gastroesophageal reflux is not uncommon after the sleeve gastrectomy procedure, we sought to assess if the sleeve produced by the gastric imbrication procedure was more or less compliant than the sleeve produced by a sleeve gastrectomy. Using 10 pig stomachs, 5 sleeves were created using gastric imbrication (Imb) and 5 were created using the sleeve gastrectomy (SG) procedure, the sleeves being created using a Covidien (Dublin, Ireland) EndoGIA Universal stapler with Green staple loads. The imbrication sleeves were constructed with the initial row employing interrupted stitches and the second row using a running stitch. For both procedures a 36Fr bougie was used to initially create the sleeve. The sleeves were then more precisely adjusted down to 36Fr using an EndoFLIP EF-620 catheter (Crospon, Galway, Ireland). The catheter measured diameter at 16 points, 10mm apart, as well as the pressure inside the balloon which is representative of the intra-gastric pressure distending the sleeve. The catheter was then inflated at a rate of 20ml/min up to a pressure of at least 35mmHg. The average diameter of the sleeve French diameter proximal to the pre-pyloric pouch was calculated, and noted along with the corresponding balloon distending pressure. The difference between the sleeve diameters for both surgical techniques was not statistically significant (p=0.42) at 28mmHg. The distension versus intra-gastric pressure is shown above for both techniques. Whereas the SG sleeve would appear to be more compliant at lower levels of intra-gastric pressure, there is some suggestion that the opposite is the case above 20mmHg intra-gastric pressure. These initial results, using pig stomachs, suggest that the compliance of 36 French sleeves created by the gastric imbrication and sleeve gastrectomy techniques are similar.